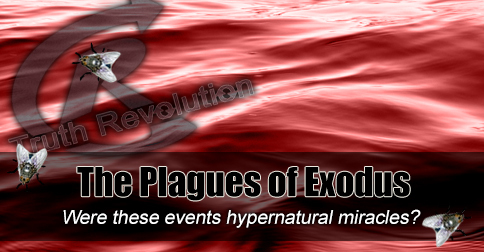 Were the plagues mentioned in Exodus hypernatural miracles? [audio:http://www.truthrevolution.tv/show/TS-0301.mp3]No Flash Support? Use this Audio Player! We did a 30-minute show on this topic! Jeff: Were they hypernatural miracles? Dave: Scholars have suggested that the blood in the Nile River could actually have been a toxic red algae. Jeff: Scientifically, the putrid environment of the Nile had caused a cause-and-effect reaction that brought frogs. Dave: Gnats would follow to feed on the frogs. Jeff: And other insects would follow that. Jeff: Which was transmitted by the insects! Dave: The human’s boils would also be caused by fly bites! Jeff: Does this mean that God didn’t do anything? Dave: NOT AT ALL! In fact, Moses still correctly predicted the time and location of those events! Jeff: AH! You see, it’s why we call it a hypernatural MIRACLE and not bad environmental luck for the Egyptians. God caused it, directly when, where, and how He said He would. Dave: This is especially true for the plagues near the end – like the dead of the firstborn. Jeff: Hypernatural miracles are the combination of scientific explanations and a Spiritual understanding of God’s interaction with mankind.